Maximise the power of your Classic Mini with our Injection Tuning Kits, part of the Engine Tuning department at Mini Sport. 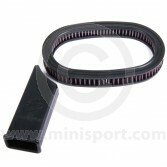 Our Injection Tuning Kits have gained international acclaim with features in recognised publications like Mini Magazine and Mini World. 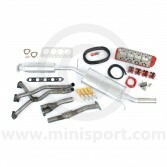 Our range of Injection Tuning Kits offers optimum performance attributes for a truly responsive Mini and an enhanced driving experience. 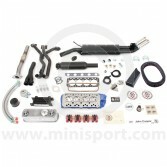 The Stage 3 Injection Kits are the ideal way to modify your Mini for increased acceleration, torque and more economical fuel consumption. 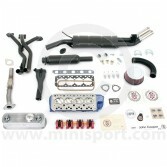 We supply Stage 3 Tuning Kits in both 1275cc MPi (Multi Point Injection) and SPi (Single Point Injection) types for suitability in a range of Classic Mini Models – complete with a Mini Sport ported and polished Cylinder Head, Alloy Roller Tip Rockers, Superflow exit exhaust system and Exhaust Manifold amongst other high quality parts and components. 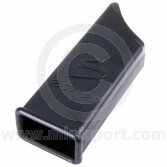 We are also stockists of the John Cooper Mini Injection Kits. 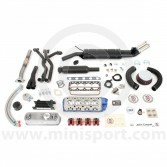 The John Cooper Mini Injection kits have gained momentous popularity with their internally recognised quality and reliability returning to modify another generation of Classic Mini’s. 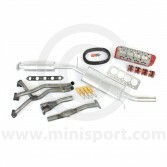 These John Cooper Kits are available as a 1275cc SPi 82Bhp Conversion and as a 1275cc MPi 90Bhp Conversion edition – designed to enhance the driving experience of your Mini Cooper. 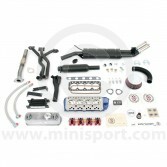 Please note that we also supply Stage 2 Tuning Kits and Twin Carburettor Tuning Kits for Classic Mini.